This year September 11 is the 15th anniversary of the day when thousands of people were killed in a terrorist attack in the United States. 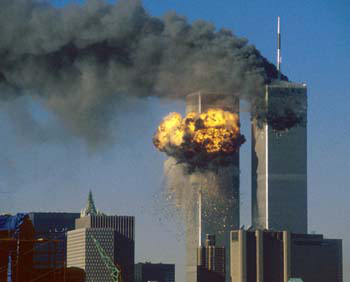 Early that morning, two airplanes crashed into the towers of the World Trade Center in New York City. All the people on the planes were killed, along with thousands of people in the buildings. Another airplane crashed into the Pentagon building in Arlington, Virginia, outside of Washington, D.C. The Pentagon is the office of the U.S. Department of Defense. The fourth airplane crashed in a rural part of Pennsylvania, when passengers fought back against terrorists who were planning to crash it into a Washington, D.C. landmark. States and cities around the U.S. are remembering people who died. There will be some activities to remember it. On Friday morning, many U.S. lawmakers gathered outside the Capitol Building in Washington, D.C. to remember those who were killed. They participated in a moment of silence and also sang God Bless America. Some people will run almost 400 kilometers from the Pentagon to New York City to honor the firefighters, policemen and rescue workers who saved many lives that day. They started on Friday in Virginia and will finish on Sunday in New York City. Everyone hopes we can live in peace, no wars, no terroristic organizations. 1. It has been _____ since the terrorist attack happened. 2. The third airplane crashed into _________. 3. On Friday morning, many ________ got together to sing "God Bless America". 4. Some people will run about ________ to remember September 11.